"All I want for Christmas is ... a home." 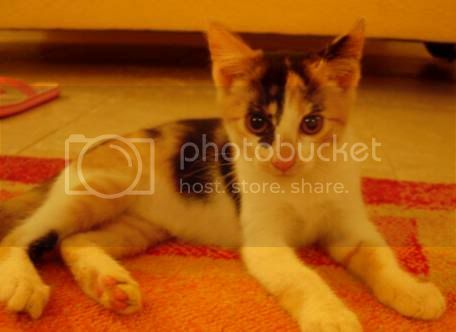 Gorgeous Tortoiseshell Kitten (8 weeks old) looking for a good home. S/he looks like quite a daring and adorable little character. If you are interested in giving him/her a loving home ... or if you know anyone searching for a fuzzy feline companion, e-mail me and I will give you the contact number that was provided in the e-mail. Of course it makes it much easier/more practical if whoever wants her lives in Trinidad. Thanks. Whilst on the topic of cats, this is my latest painting ... as yet unnamed. Any ideas? I like the colours you used, and the depth of the painting - you do abstract really well. Is the cat 'blue' because he lost his whiskers? I think it's a her, because another friend told me by e-mail he thinks she looks like an cat goddess he would have seen in 'catwoman' or in Egypt. 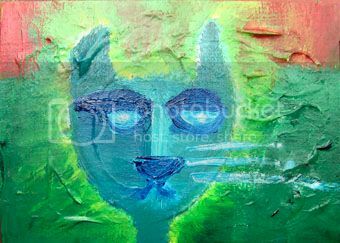 So taking that, plus Silvergull's comment and your comment, I'll call the painting: Blue Molly, the feline Goddess.